As part of my big overall effort to upgrade my winter riding experience this year, I ordered a Helmet Helpers Polarfleece Original Cozy Riding Cover as part of my big Christmas order. It retails for $38, and I paid $23.96. I bought it in black. 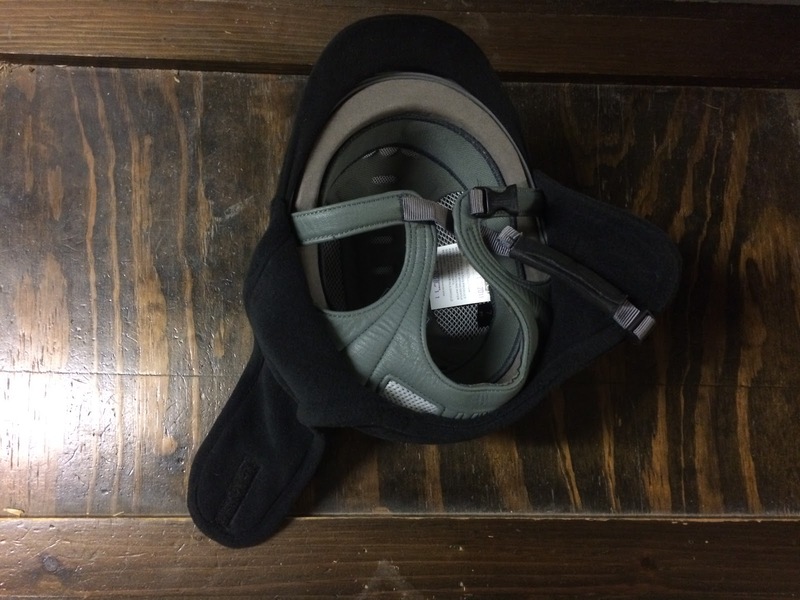 The idea is that it goes over your helmet and helps block wind and keep your head warm. 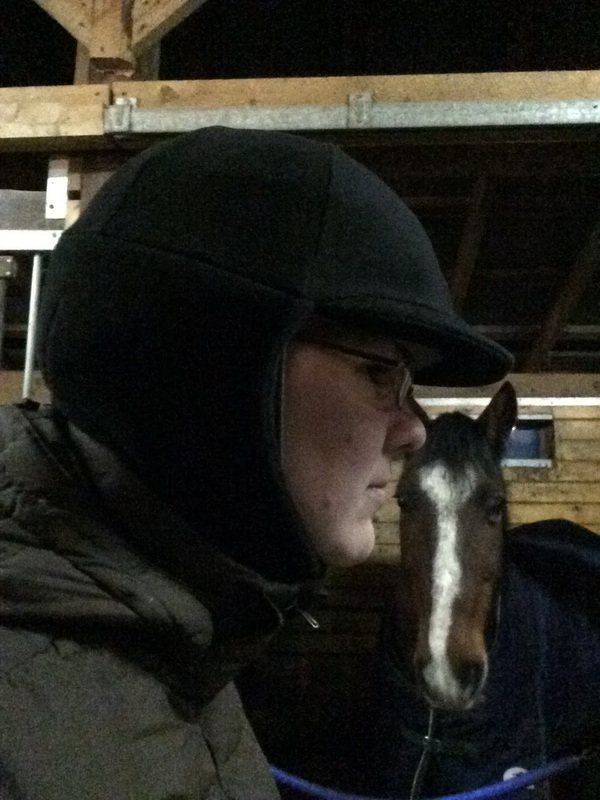 I am a big believer in keeping your head covered during winter; the human body loses some astonishing percentage of its heat through the head, and it can make a big difference to keep a hat on. It’s for that same reason that a vented helmet can make a big difference. 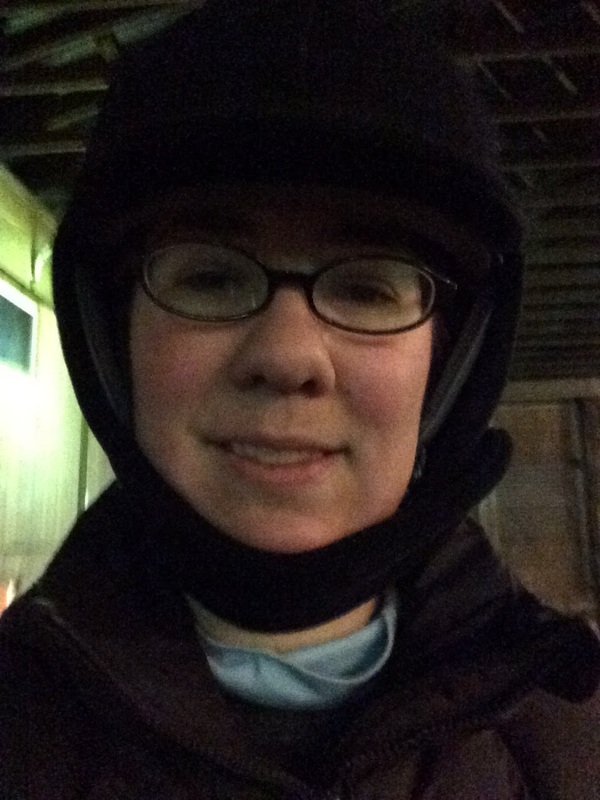 My beloved new helmet is very much vented, and in the past I’ve gotten nasty earaches from riding in the cold, so when I learned that something like this existed, and it made sense for my budget to pull the trigger, it was at the top of my list. First impression: LOVE LOVE LOVE. I was quite frankly surprised at how quickly and easily it went on my helmet. It was snug without being too tight. I was actually imagining it would go on like those rubber bell boots and STAY ON, but that is very much not the case. It slides on and stays on firmly. The trick was to start with the brim and then pull the rest down. 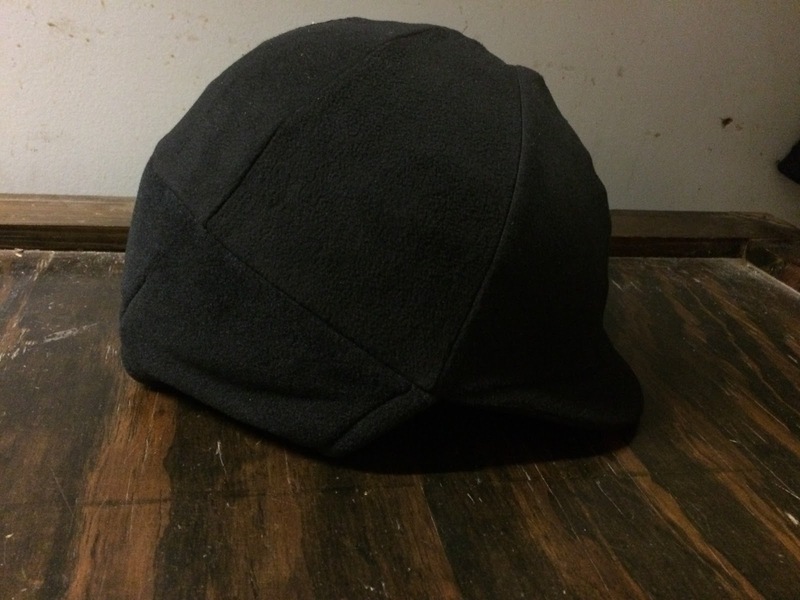 It’s well-stitched and sturdy, and does not necessarily rely on elastic to cling to the helmet, just good snug fit. Make no mistake: this is not a fashion statement. 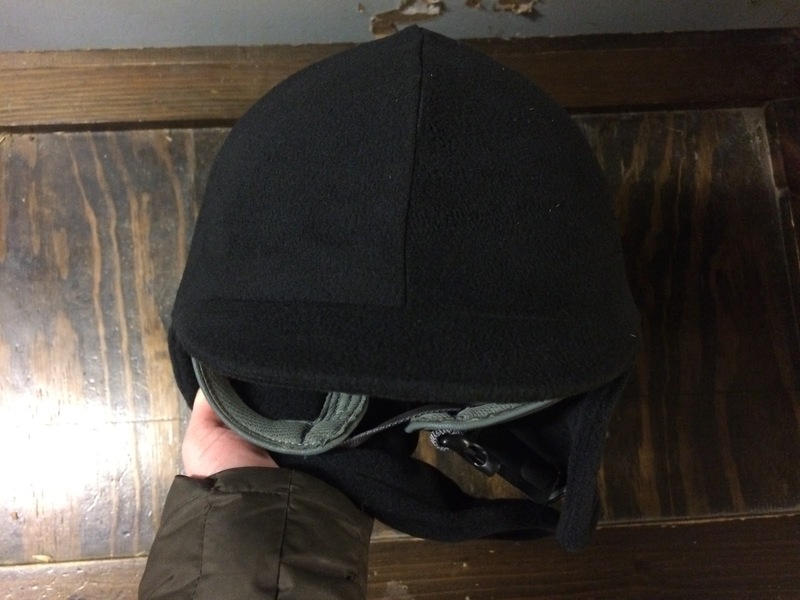 It might be with the right fabric or whatever, but though it is relatively sleek and unobtrusive, it is still a big piece of fleece covering your helmet and your entire face. Ohhhhhhhhh yes it does. It really does. It works in two ways: first, as a windblock, it keeps cold breezes from going through those lovely vents and taking away my body heat. Second, it traps the heat that is generated by my body and keeps it from flying out those vents. All of that means that it works during warmup and then again during my ride itself. If I could say one bad thing, it would be this: the chin strap bit is not as functional as it should be. The velcro is a bit thin, and is placed a bit too high up. I have a fairly average head. I should be able to get the velcro on immediately, every time, and it should cover itself by at least half. Most of the time when I’m doing this it takes me one or two tries, and then I only catch the end of the velcro. It has not come undone, but it’s definitely a design flaw. you have no idea how much I did NOT want to share this photo, but for the sake of completeness, here’s what it looks like from the front. 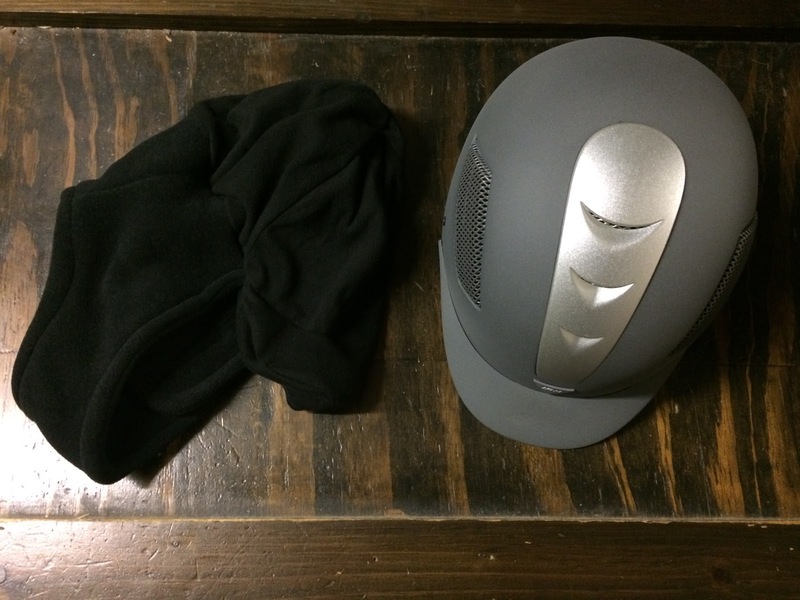 In summary: if you ride in the winter, you need one of these. It works as advertised, and works well. Nice! That's really good to know – I've always wondered about these. I just remember the question that I had!!! (I had forgotten what it was by the time i got to commenting. TGIF.) hows the peripheral vision while you're wearing it? I have not noticed any true difference. It's cut back far enough, and is close enough to your head, that I don't think it would impede at all. It basically follows the lines of the helmet's harness. I've always wondered about the effectiveness of these. Sounds like they're worth it! It honestly looks better than I expected seeing them before, not that how it looks really matters as long as it works. I'm glad that it helps and completely agree with you about the importance of keeping your head warm (I wear a beanie anytime it gets below 45° because I get headaches when it gets any cooler than that).